Turn obsolete Cassette Tapes into Education! Part 1. In my basement, taking up valuable space sits a box housing over 100 of my cherished cassette tapes. Remember the days of Columbia Music subscriptions? Yep, I belonged, and thus the vast collection and wide array of music genre. Fast forward 20+ years. The only cassette player I own is in my sports car that is out of commission in the garage. Really out of commission, like, can't even open the hood to see what is wrong, been sitting idle for 3 years commission. (Another item I need to let go of. One day.) The last time I did listen to any of the tapes was last year when I had my hands on an old boom box. It ate the tapes. This morning, the anti-clutter me is screaming "go drop that box off at Goodwill". The emotional me holding on to my youth is screaming "wait, maybe you can find another use for them." BAM! I'm all about repurposing items so why can't I repurpose these relics? Quick Google search and I found a lamp made with zip tied tapes. Nah, not for me. A few pages later I found a cassette book. An Etsy seller up-cycles items into books and journals. BINGO! It hit me hard. 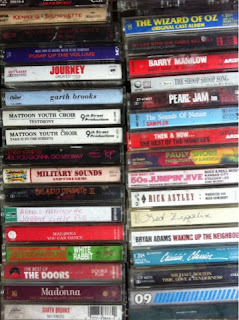 Choose a tape...let's say Barry Manilow Greatest Hits Volume 1. Now I create, on the fly-it is summer break after all- an entire unit around this tape. 2. All about Barry: Born June 17 (my daughter's birthday BTW); Jewish; from New York; Jingle writer, etc. etc. There are math, culture, history, and geography lessons all rolled up into my favorite Artist. 3. The topics we cover can be entered into the journal: cut out pictures to glue, practice writing, etc. 4. Listen to his repertoire on Music day (via iTunes or Pandora or my CD collection of course). 5. Create a shelf in our school area to house this new library of learning! I don't anticipate creating over 100 of these little books but I can save my most cherished cassettes and use them. The left overs can then be gladly donated! Stay tuned for a follow-up on how this new homeschool project turns out!